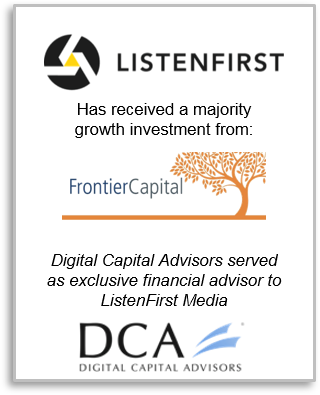 NEW YORK, NY - September 5, 2018 - Digital Capital Advisors, LLC ("DCA") is pleased to announce it has served as exclusive financial advisor to New York-based ListenFirst Media ("the Company"), a SaaS-based provider of comprehensive social analytics solutions to leading consumer brands, on its majority growth equity investment from Charlotte-based growth equity firm Frontier Capital ("Frontier"). The transaction underscores the continuing need for social analytics by major consumer brands such as NBC Universal, Conde Nast, Time Warner, and Gap, Inc. With deep roots in Media & Entertainment, ListenFirst has emerged as an industry leader in comprehensive social intelligence solutions for consumer brands across a variety of verticals including fashion & retail, travel & leisure, finance, and healthcare. The social media analytics space is positioned for robust growth, with corporate investment in digital and social marketing growing at a rapid pace. According to Markets & Markets, the social media analytics market is expected to increase at an annual rate of approximately 29% reaching an estimated $9.5 billion by 2022.